Save BIG at Bar None Country Store this Labor Day! 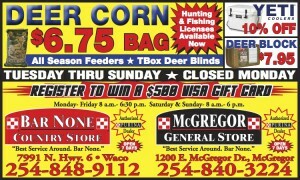 Looking for deer corn & supplies? We have the lowest price on Deer Corn, Bar None! Deer Corn: $6.75 per 50lb Bag! Register to win a $500 Gift Card! Winner announced via Facebook on Tuesday, September 3! Sale prices good while supplies last or through Sunday, September 1, 2013! This entry was posted on Wednesday, August 28th, 2013 at 10:18 am	and is filed under Events, News & Updates. You can follow any responses to this entry through the RSS 2.0 feed. Both comments and pings are currently closed.